2 Pet Food Bag Seals - Reusable Forever Just $3.99! Ships FREE! You are here: Home / Great Deals / 2 Reusable Pet Food Bag Seals Just $3.99! Ships FREE! 2 Reusable Pet Food Bag Seals Just $3.99! Ships FREE! 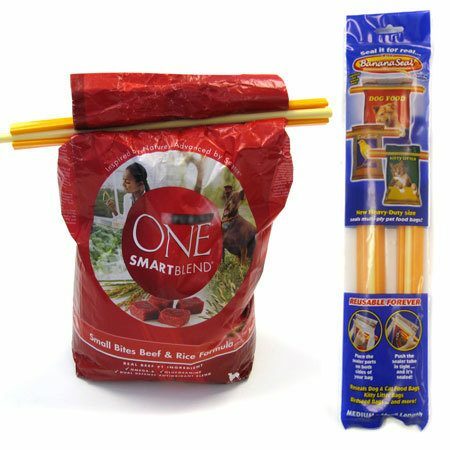 Keep your pet’s food fresh with the Banana Seal 2 Pack! Order the Set of 2 Pet Food Bag Seals – Reusable Forever for Just $3.99! Shipping is FREE! Reusable forever, these sealers can accommodate most any size pet food bag and keep your pooch’s food as fresh as the day you opened it! The seals measure 14.5″ long!